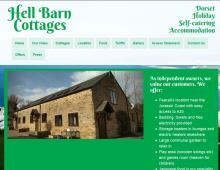 Hell Barn holiday cottages offer five beautiful self catering holiday cottages in Bridport, Dorset. These converted 18th century stone barns provide comfortable and spacious self catering holiday accommodation, with gardens that look out over rolling farmland in this beautiful Jurassic Coast region of Dorset. Come and explore the recently filmed Broadchurch location with Bridport and West Bay just 10 minutes drive away where this ITV Drama was recently filmed. Hell Barn's owners also offer delicious Japanese catering. A great selection of Japanese dishes can be cooked for you at the table of your picturesque Jurassic coast holiday cottage between Bridport and Charmouth in Chideock, Dorset. A cottage vacation in this area gives you access to wonderful walks in the Dorset countryside as featured on ITV's recent Best Walks With A View With Julia Bradbury. Short breaks are also available outside the peak season, so why not book a Dorset holiday cottage break today!